Cast: Cole Hauser, Lena Headey, Eddie Cibrian, Morris Chestnut, Piper Perabo. Story: Stupid spelunkers vs pointy monsters. Death, taxes and crappy mainstream Hollywood thrillers - the unavoidable constants of life. I guess I would rather watch The Cave again than die or be taxed, but I had to think about it. The Cave is a very long tunnel under the ocean, discovered by a set of cave diving experts who subsequently get attacked by nasty sharp cave thingies. 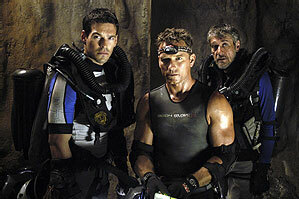 Sounds familiar ... oh yes, it's almost exactly the same as that other cave-diving turd, The Descent. In fact, you may as well just go over there and read that one, as it's so similar that it'll be hard to remember which bits happened in which film when they come round on DVD. The Cave is more water-based and more Hollywoody, but the level of sewage and the overall I-don't-care-what-happens feel are identical. In fact I may not care enough to finish this review, because I've had all the creativity sapped from my veins like a kid trying to get the last bit of juice from his ice pop. You know you're in the presence of mediocrity when you simply can't summon up the enthusiasm to even listen to what the dozy-arse potholers are saying, knowing that it'll be trite and irrelevant and will waste some more precious moments of your life that could be used wondering what to have for dinner. Let's try and find some positives. 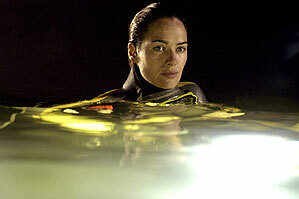 Some of the in-cave shots are quite impressive, and Lena Headey (The Parole Officer) is good. The mid-point of the film, as the pace begins to pick up, isn't entirely dreadful and contains a little suspense. It doesn't last long though, as events swiftly swing from daft to absurd and the monsters turn into muppets in pantomime, thus fitting in with the rest of the cardboard all-American hero cast. The special effects are rather poor by today's standards, the script is cheesier than a packet of Wotsits and the plot is dumb and heavy-handed, with a sudden and utterly pathetic ending. It's not even gory enough for the blood brigade, as the appropriate 12A rating suggests. Good job I'm looking for positives or I might have been overly critical. To be fair, I barely prefer The Cave over The Descent, the scales being tipped by the suspense factor. The Cave tells you there's a monster round the corner, but doesn't then blast you with a loud noise to make you jump. This alone makes it the winner of this particular minor league tussle, but that's like saying a Hyundai Accent is quicker than a Daewoo Matiz. They're both as slow as Paris Hilton's retarded cousin, so it really doesn't matter. The Cave needs its entrance sealed up so that poor unsuspecting Blockbuster customers don't stumble across it by accident. It's not the worst of its breed, but as it makes no attempt to challenge for adequacy I can't recommend it to anyone except the unlucky few who just have to see all the "scary" movies for completeness' sake. To enjoy this film you should: enjoy tawdry brain-off thriller killers. The Cave is on general release in the UK now.